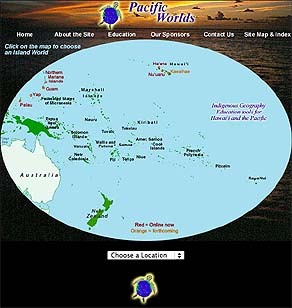 Welcome to Pacific Worlds, a non-profit indigenous-geography education project for Hawaii-Pacific Schools. The history and principles of this project are described on the Guiding Principles page, and help explain why this site is created and organized the way it is. Pacific Worlds serves two roles: first, it is a vehicle for cultural preservation and the perpetuation of indigenous traditions in the Pacific. In this role, it presents Pacific Islands—from Pacific-Islander perspectives—to the entire world. Whether you are a tourist or a scholar, this site will transform your understanding of Pacific cultures and environments. Second and more specifically, Pacific Worlds comprises an indigenous-geography education project serving Hawaii-Pacific Schools. Pacific Worldsis incorporated in the State of Maryland, and is applying for 501(c)3 federal non-profit status. Pacific Worlds adheres to high standards of appropriate methodology and intellectual property rights for indigenous peoples. (2) A curriculum with exercises for the teaching of Geography from indigenous Pacific Island perspectives. Exercises are tailored to the eight content themes of the websites, plus an introduction to indigenous geography. Since the purpose of this project is cultural preservation as well as education, you do not need to be a student or educator to appreciate the extensive content presented here. 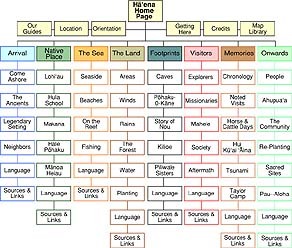 This site is useful for anyone interested in Pacific Island cultures and environments. The homepage provides links to community-focused websites, both via the map and via the drop-down menu. Each of those websites is a complete package. In the top corner of most pages is a link to the online curriculum. Exercises specific to that chapter's theme will open in a separate window. (2) Follow a given theme across one or more of the websites, to compare cultural perspectives across different locations. In either case, there is an online set of exercises comprising a complete curriculum, with the exercises linked to specific chapters or themes. One can use these exercises to explore themes in indigenous geography, either in part or in whole. More about the curriculum, including links to download a soft copy, is available in the Education section of this website. Each community website focuses on a specific, village-level Pacific Island location. This small scale of observation allows for a very personal, close-up look at how culture and environment interact in a specific locale, while also demonstrating the larger culture, history, and geography of the island entity as a whole. Each website, when read from start to finish, tells a complete story about that community and the larger entity in which it resides. And each website is narrated by a number of "Guides" that include members of that community, as well as local historians and environmental experts, and other cultural keepers. These guides are introduced in the introductory section of each website, and it is important that readers familiarize themselves with these speakers. Virtually all text within each website is first-person narration from these guides. 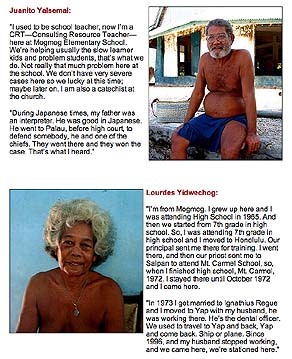 Example of guides' self-introduction, from the Yap-Ulithi website. Click here to go to this page. Architectural template for Pacific Worlds websites. This example is for the Ha‘ena, Kaua‘i (Hawaiian Islands) site. Click here to open this page. The structure of each website includes, first, an introductory section that orients you to the village or community being explored. The guides are introduced here, as well as the geographic and relative location of the community. Like the introductory section, the eight chapters each begin with an illustrated table of contents, and a link to a separate page that explains the principle behind that particular chapter. The chapters follow a roughly historical trajectory, from most ancient to most contemporary. But they are also thematic, combining historical and contemporary perspectives on the topics in each page. Glossaries in the indigenous language are provided at the end of each chapter of each website, along with bibliographies and links to other source materials. News: The Pacific Worlds architectural template is being updated and expanded. Each website follows this distinct template including an introductory section and eight thematic chapters. 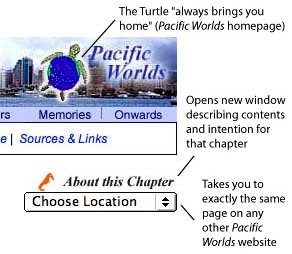 Use of this template allows us to link parallel pages and sections across all Pacific Worlds websites. This allows you, the reader, to follow specific topics across the different locations within Pacific Worlds. For example, you might be interested in islander traditions regarding The Sea (an entire chapter). Or you might want to learn about indigenous approaches to the Forest (one page within The Land chapter). All websites are linked in a web that allows you to jump from a page on one website to exactly the same page on a different website. This way, readers may perform comparisons of the same themes across different locations. And here again, the exercises may be engaged. 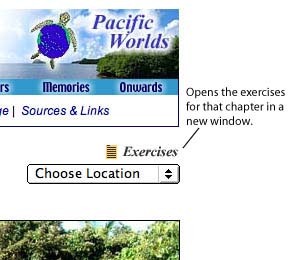 All content pages have a drop-down menu that allows you to jump to the same page on any other Pacific Worlds website. To learn more about navigating this site, click here. We invite input from teachers, students, and community members on both the websites and the curriculum.